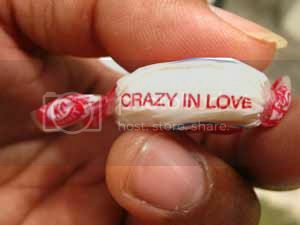 Thanks, Attilah for reminding me of "Giet of friedship" ... one of the most notorious KC wrappers of all time. How could I have forgotten it? For those who don't understand the phrase due to the misspelling, 'Giet of friedship' is actually Gift of friendship. Anyway, I hate to be the bearer of disappointing news ... but SK has not yet returned my call. Perhaps, as we have a long weekend ahead of us (Indian Arrival Day), many are preparing for festivities or have gone somewhere for the few days. In the mean time, let's cool things down with a KC mint recollection that my fried ... I mean friend Glen shared with me about two days ago. (Transcribed from dictaphone). Glen holds up a mint he chose from my KC bag that day. The spelling of 'crazy' on this message has been amended. I seem to remember it at one point saying 'Carzy in Love'. Elspeth: So you mean she would see you giving the mints? Glen: No. Initially she didn't know where it was coming from, because I would get friends to give it to her. Elspeth: Okay ... so every day you would give her mints? Glen: No, not every day ... but you know, that was the first connection that was made ... with KC mints. I can't remember the exact line that was used, but I chose one ... you know, the best line. I really can't remember it, but I used that and I gave a friend to give it to her. Elspeth: Don't tell me she ended up with the friend! Glen: No, no ... there's a secret admirer involved here. You know? So that was the first method. But mints ... mints ... I would agree have always been a part of life in Trinidad. You know everbody has a mint. You go to a doctor's office, you know, there's a little bowl. Even my plumber on Watt's Street ... he has a bowl for his customers. Elspeth: I like that. (Putting forth the bag of mints). Now pick one from this bag and see what you get. Elspeth: If you pick one now ... does it mean anything now? Would you give it to somebody now? Glen: Yeah (Laughing) But then it was the only thing I coulda think about! (Pause). I didn't get the girl though. And the guy I sent it with didn't get her either. I have a Giet of Friedship for you. Was hoping you could visit and add your flag to my counter. I found you after viewing this "FLUTTERBY" photogallery. Thank you for the giet, Ancient Clown. Fellow Fire Horse.